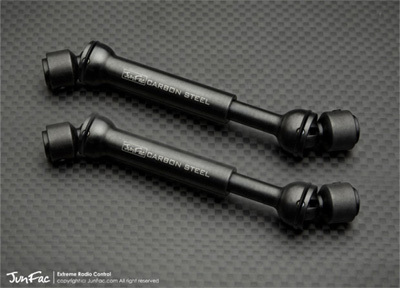 JunFac Hardened Universal Shaft for Gmade R1 Rock Crawler Discounts Apply ! JUN90026 - JunFac Hardened Universal Shaft for Gmade R1 Rock Crawler. Light weight and CNC Machined from solid billet carbon steel with black finish. Heat treatment for super smooth operation. Shaft travel: 95-130mm (35mm total travel). Laser engraved for authenticity. Made to fit 5mm output shaft. Fits Gmade R1 Rock buggy (stock) and custom truck (5mm output shaft). What's included: JunFac Carbon Steel Universal Shaft (95-130mm) 5mm hole x 2, Joint Grease x 1, Spare U-Joint Coupler x 2 and Instructions. Made for the Gmade R1 rock crawler.